Energy’s Power Bar Elite isn’t as richly featured as some of its competition, but it bests most of them with superior sound quality. If you’ve come looking for a review on the latest nutritional supplement, we should let you know now that you’ve been unintentionally misled. The Energy Power Bar Elite isn’t a dense, mealy-tasting lump of fruit and fiber aimed at the empty tummies of the richest 1 percent; it’s actually a powered sound bar with a hearty side dish of wireless 10-inch subwoofer targeting that gaping void under your TV. Think of it as a feast for your ears. Sound a little more appetizing? Good. Not to over-milk the hyperbole, but the Power Bar Elite’s somewhat unfortunate name did get us thinking that the two unrelated “bars” do share a couple of things in common: they both exist in crowded markets, and some of the alternatives are definitely more palatable than others. Is there really room for another flavor of sound bar? If it sounds good and helps kill the nasty aftertaste left over by some of the sour-sounding solutions we’ve heard in the past, then we say: absolutely. Read on to learn whether or not Energy’s latest sound bar offering manages to sweeten the pot of simple home entertainment options. We think Energy might be over-valuing the notion of a one-box solution just a bit. The packaging for the Power Bar Elite is flat out wasteful. Take a look at the empty spaces on the left and right side of the packaging in the photo below. What filled those spaces before was nothing more than a couple of empty boxes. It doesn’t take a tree-hugger from Oregon to see that both the added bulk and wasted cardboard are unnecessary. We think folks would be ok with two boxes…really. Environmental concerns aside, the contents of the overgrown box do provide a hint at just how simple the Power Bar Elite setup is. We found the sound bar, the 10-inch wireless subwoofer, two AC cables, a modestly sized power brick (DC converter), a 1.5-meter digital optical cable (just under 5 feet), a 3-foot RCA interconnect cable, two “feet” for stand placement, a mounting template for wall mounting and a small remote control. The sound bar measures 4.4 x 40 x 3 (H x W x D in inches) and weighs an airy 7 lbs. 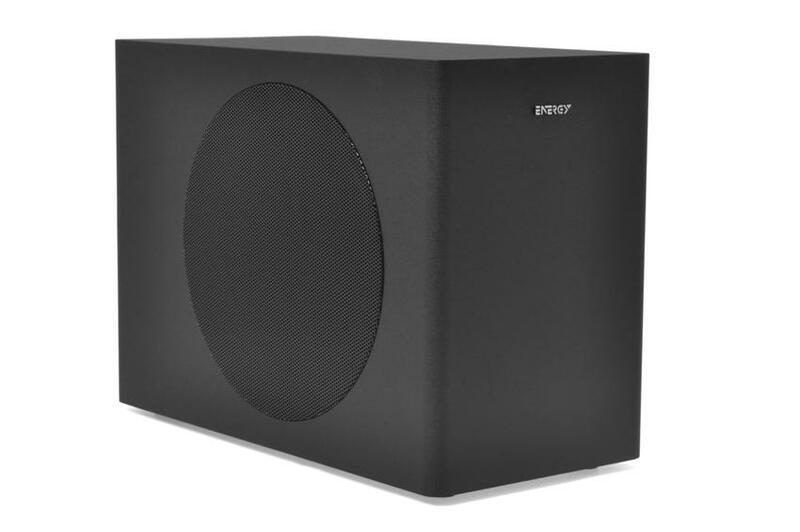 The subwoofer measures 14.5 x 9 x 18 (H x W x D in inches) and weighs a respectable 25 lbs. The Energy Power Bar Elite is a 2.1-channel system with the added ability to simulate surround sound using some fancy electronic wizardry. The sound bar has a total of six drivers built into it, with two 3-inch mid-bass drivers and a ¾-inch tweeter occupying the far left and right ends of the bar. On the back of the sound bar is a digital optical input, analog stereo input, a DC power jack and a power switch. The low-profile plastic enclosure has a satin black finish, and its cloth-covered grill is removable, though we think the sound bar looks much better with it left on. The subwoofer’s 10-inch fiber-composite driver fires from the left side of its tall, rectangular cabinet and is covered by a perforated metal grill. The unit’s amplifier sits on the back, featuring only a volume control and an AC power cord jack. The sub has four wide rubber feet installed — it doesn’t appear aftermarket spikes and footers are an option here. The sub’s finish is an attractive, textured black vinyl. Energy claims the system has a 250-watt peak power handling, which didn’t make a whole lot of sense since it has power, it doesn’t have to handle incoming power the way passive speakers do. To clarify, we contacted Energy and were told the sound bar uses a 50-watt per-channel class D amplifier, while the sub is powered by a 150 watt class D amp. Built-in processing includes a Dolby Digital decoder and a 3D surround mode. The latter is intended to create a surround sound effect without the need for additional speakers. The Power Bar Elite’s remarkably simple setup is one of its most appealing features. Rather than involve an A/V receiver and multiple connections with potentially messy wiring challenges, the Power Bar Elite is designed to get its signal directly from the TV, via either an optical digital cable or analog RCA connections. This way, whatever is being fed to the TV (be it cable, satellite, Blu-ray, DVD, or video game console) is made available to the Power Bar Elite. While getting a signal to the sound bar is simple enough, getting power to it could be tricky for some. The small power brick that feeds the sound bar its juice is going to have to be placed somewhere. It isn’t the sort of thing that should be hidden in a wall, so it will likely need to placed on the floor somewhere. Since the cable that runs from the brick to the sound bar is six feet long, the distance from the floor to the sound bar will need to be shorter than that. For those with TVs mounted at stratospheric heights, this could be a problem. The beauty of the subwoofer is its built-in wireless functionality. This allows the user to place it just about anywhere in the room (within reason), plug it in and, almost magically, it works. There’s no pairing to worry about, no wireless channel to select; just plug and play. Finally, mounting the sound bar is made easy both by the bar’s light weight and the simple keyhole mounts built into the rear of the unit. The provided template, in theory, will make drilling pilot holes for screws easy. We found that the template we received matched the keyhole locations on the sound bar exactly, but it’s always best to double check –measure twice, drill once, right? Also, due to the spacing between the keyholes, it is unlikely they will line up with studs, but this shouldn’t be a problem as a good drywall anchor should hold the lightweight sound bar with no issue. While the Power Bar Elite is geared toward TV, movie and video game playback, we always begin testing any speaker with music first. Playing music we are intimately familiar with will expose the strengths and weaknesses of any speaker system. Plus, we can see users wanting the option to play back music through TV apps like Pandora or Rhapsody or from satellite and cable music stations. Musically speaking, the Power Bar Elite’s strengths lay in its treble and upper midrange response as well as its stereo and imaging effects. Its ¾-inch tweeters do a fine job of reproducing clean, sparkling highs without ever getting aggressive (we don’t think anyone will ever accuse this unit of sounding fatiguing). Upper midrange response is smooth and well integrated with the tweeters. We’re also impressed with how transient sounds came across cleanly and with authority. The meat of the midrange region is also well represented, with vocals coming through with an impressive amount of presence, especially given the speakers’ size. Stereo effects are played out with enough definition that we got a strong sense of left and right, but it was the sound bar’s greater imaging properties that we were most surprised by. Even without 3D mode engaged, sound seems to come from well outside the edges of the sound bar, serving up a very wide soundstage and creating a sense that the speaker system is much larger than it appears. Where the Power Bar Elite fell short for us was in the lower midrange and bass areas. There’s a small hole in the system’s response between 110Hz to 125Hz where the midbass drivers roll off and the subwoofer picks up. While listening to a solo bass guitar performance, we noticed that certain notes were much quieter than others as the player moved up and then back down through his available range. Also, we found the bass response to be disproportionately loud around 90Hz, lending a slight boominess to the subwoofer, even in our larger testing room. But do any of the aforementioned shortfalls have any ramifications on the Power Bar Elite’s performance for movies, TV and games? Based on our experience with the unit, we say: very little. We logged just over an hour of broadcast TV, movie trailers, movie clips and gaming on the system and not once did we catch ourselves thinking: Hmmm…that grenade explosion seemed a little lean at 110Hz. This is probably because, while enjoying this sort of content, the mind is steered in so many different directions that detecting those nuances would require taking focus off of the entertainment and placing it in a very specific place. We simply didn’t find ourselves having that problem, with one small exception. The subwoofer has a tendency to sound a bit boomy at times. We tried backing the subwoofer’s level down, and that did help during those more explosive moments where the sub tended to sound a little bloated, but the other 95 percent of the time, we found ourselves wanting more bass. So, we settled on the setting that had the sub blended well with the sound bar for the lion’s share of the time and ignored the occasional boom. We strongly recommend avoiding corner placement with this subwoofer, as going that route served to exacerbate the problem in our tests. The Energy Power Bar Elite retails for around $600 online. We decided it would be a good idea to look at competing solutions at or below the $600 price point. Vizio’s $320 VHT215, for example, has dual HDMI inputs and an HDMI out, as well as digital optical, coaxial and analog connections — all at half the price. However, that system offers a much smaller subwoofer and, historically, Vizio’s audio offerings have sounded less refined than Energy’s. Boston Acoustic’s Tvee Model 30 compares very closely with the Power Bar Elite. The Tvee Model 30’s subwoofer is tighter and integrates more harmoniously with its sound bar, but it can’t match the depth or output volume of the Power Bar Elite. As for the sound bar itself, we did appreciate having vocals anchored in the center of the Tvee Model 30’s three-channel system and the Bluetooth wireless connectivity was pretty handy to have available as well, but Energy’s offering has better refined treble and a more comfortable sound in general. Energy’s Power Bar Elite isn’t as richly featured as some of its competition, but it bests most of them with superior sound quality. Its refined treble, clear midrange, intelligible dialog and deep, loud bass response is offset only by an occasionally unruly subwoofer. 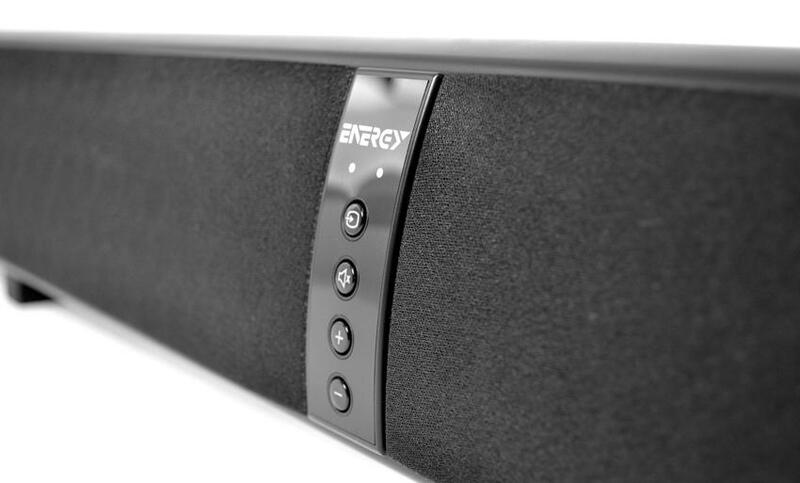 While this sound bar solution from Energy certainly earns its asking price, it doesn’t necessarily lay waste to the competition, making it a competitive option, but not a slam-dunk choice.